CCIE Routing and Switching Certification Guide, Fourth Edition, is a best-of-breed Cisco® exam study guide that focuses specifically on the objectives for the CCIE® Routing and Switching written exam. Well-respected networking professionals Wendell Odom, Rus Healy, and Denise Donohue share preparation hints and test-taking tips, helping you identify areas of weakness and improve both your conceptual knowledge and hands-on skills. Material is presented in a concise manner, focusing on increasing your understanding and retention of exam topics. 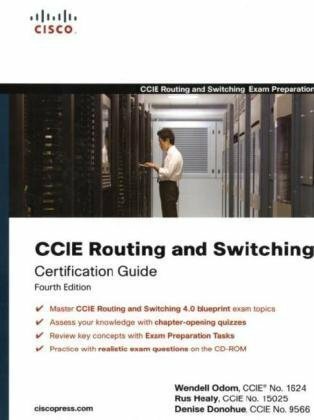 CCIE Routing and Switching Certification Guide, Fourth Edition, presents you with an organized test preparation routine through the use of proven series elements and techniques. “Do I Know This Already?” quizzes open each chapter and allow you to decide how much time you need to spend on each section. Exam topic lists make referencing easy. Chapter-ending Exam Preparation Tasks sections help drill you on key concepts you must know thoroughly. CCIE Routing and Switching Certification Guide, Fourth Edition, is part of a recommended learning path from Cisco that includes simulation and hands-on training from authorized Cisco Learning Partners and self-study products from Cisco Press. To find out more about instructor-led training, e-learning, and hands-on instruction offered by authorized Cisco Learning Partners worldwide, please visit www.cisco.com/go/authorizedtraining. The CD-ROM contains 200 practice questions for the exam. their study efforts, and enhance their confidence as exam day nears. This book has allot of errors. Besides typos and references to tables they have some information just wrong. For example it talks about PIM-DM state refresh messages. Book says they are sent upstream from routers, however when I tested it in the lab I found that the messages can only be originated at the source interface for the S,G and sent downstream and are not enabled by default as the book would have you think. This makes me wonder about the credibility of the rest of the information in the book. Most information seems correct however. They really should have taken more time fact-checking and editing this book. Some sections are broad overviews and I find myself reading into more specifics in the CCNP books that cover the same topic. "Both shared and shaped mode schedulers prevent the PQ from exceeding its configured bandwidth when all the other queues have frames waiting to be sent. The shaped scheduler never allows any queue, PQ or non-PQ, to exceed its configured percentage of link bandwidth, even if that means that link sits idle." "The expedite queue is a priority queue, and it is serviced until empty before the other queues are serviced." I ran this by a few other engineers, and they also agree with this assessment, that it will indeed starve the other queues unless you explicitly configure policing. Overall, the book is really great though. I just hope they update that section.I'm also surprised that the book never mentions that Spanning-Tree BPDUs are sent to the MCAST address 01:80:C2:00:00:00. There's also not much detail on QinQ tunneling, and I had to access other resources to get the config portion. Overall, though, I feel that this has covered all material you'll see on the lab pretty well, though it is not a deep-dive, and you need to master all of the config and troubleshooting with LOTS of hands-on still. I bought this book to prepare my CCIE written exam and what can I say is that this book isone of the best books I've ever read on networking. I started my Cisco Career with the CCNA exam book and the style is very similar (thanks Mr Odom). You will be able to find DIKTA topic (Do I Know This Already ?) and it really help to gauge your knowledge on the topic. I tought I knew the spanning-tree protocol and after I checked the answer I told myself that I needed to read a bit more about it .... Such a great thing ! The content is very well-structured, all concepts are supported by numerous examples so even if one doesn't understand the subject in it's depth he or she can find an answer to a specific real-world question. This book will provide you great insight and deep understanding of a wide scope of networking subject. It definitely helps to understand the technology. The words used by the authors are very simple to understand and it is very easy then for a non fluent english speaker (such as me). The examples used in the scenarios makes you feel confident with the topic. This book is A MUST Have for every serious CCIE student. I highly recommend it ! Also you will receive a DVD which let you install Boson software and practice the CCIE written exam. It is awesome to train on that product. It really helped me ! Exceptionnal work Wendell Odom, Rus Healy, Denise Donohue. also keeping in mind we need to renew our written exam certification every two year this book will be needed today or tomorrow I agree Cisco will add stuff but still book looks very promissing to me. This self-study exam preparation guide for the Cisco Certified Internetwork Expert - CCIE certification exam contains everything you need to test yourself and pass the Exam. All Exam topics are covered and insider secrets, complete explanations of all Cisco Certified Internetwork Expert - CCIE subjects, test tricks and tips, numerous highly realistic sample questions, and exercises designed to strengthen understanding of Cisco Certified Internetwork Expert - CCIE concepts and prepare you for exam success on the first attempt are provided. Cisco Systems has created today's premier networking certification, the CCIE (Cisco Certified Internetworking Expert). Obtaining the Cisco CCIE certification is the goal of many network engineers, and not a very easy task. The passing rate of the test is amazingly low, with some estimates under 10% passing. This book includes new exercises and sample questions never before in print. Offering numerous sample questions, critical time-saving tips plus information available nowhere else, this book will help you pass the Cisco Certified Internetwork Expert - CCIE exam on your FIRST try. Up to speed with the theory? Buy this. Read it. And Pass the Cisco Certified Internetwork Expert - CCIE Exam. Depending on where you are in your career is how I'm going to rate this book. If you are somewhat new to security, especially in the Cisco world, this book is the book for you and deserves 5 stars.If you have been in the Cisco security world for several years, are looking to study for your CCSP or CCIE, this book is NOT for you and deserves 1 or 2 stars. This book does a great job on going over much of the Cisco security portfolio.It goes over the Cisco firewalls, AAA, NAC solutions, IPS, MARS, VPNs, etc.It gives some basic configurations for most of these.Again, I said basic and for a lot of these I would go as far as to say MINIMAL. Again, if you are looking for study material for some of the CCSP exams or CCIE, this book wont get you close.Those exams dive WAY deeper into the different technologies than what this book offers. My real issue with the book is the top line in the title "CCIE professional developement".If I see this and I see its 700+ pages, I'm thinking a Jeff Doyle TCP/IP Vol content book.Nope, not even close.If the authors wanted to cover all the different technologies that they did, but consider this book a "CCIE developement", they should of split this book into two books and expanded GREATLY on the different technologies. This book is ok as a reference, but I would recommend it only as an introduction or guide - perhaps to give an idea of the topics that you might encounter on CCIE written, and which could be the basis of further research of your own.I agree with the previous review that said the book is too brief in many sections - some sections (esp. in Chapter 3) provide minimal value. I am also very annoyed with the number of basic errors in this book.The technical reviewers have done a truly lousy job here. Here's some of the most basic I have found in the just the first couple of chapters. 1. Page 25 - Class D addresses first byte range 224-247. I am amazed at how Cisco can let such fundamental gaffes like this out in a book targeted to CCIEs. Neither of these are currently corrected in the errata on the [...] site either. "During the rebootubf (sic) process" on Page 59 - I understand that typos can be missed but I wonder if the reviewers from Cisco have actually read this paragraph! For me the book does provide some value in CCIE preparation, but for books priced around $60 I would have hoped the completeness, accuracy and quality would have been a lot higher.Perhaps later editions of the book will correct these issues (I have the Mar 2008 printing). The book is surely a good reference and deals with many security topics,and is up to date. Unfortunately many links provided are not working. However it takes far more research on Internet to prepare for CCIE Security, and in some cases (such as Transparent Firewall or Multiple Contexts) to understand better, since they are very important and somehow too shortly addressed. Well written Easy to Use Network Security Resource...! 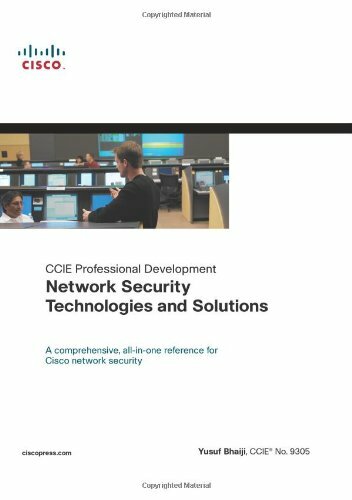 Yusef Bhaiji offers an extremely well written, easy to understand, highly descriptive solution to network security technologies and solutions from a Cisco network security stand point. In addition to dividing the book into five parts mapping to Cisco security technologies and solutions: perimeter security, identity security and access management, data privacy, security monitoring, and security management, the book also offers a Best Practices Framework.This is accomplished by noting critical Regulatory compliance and Legislative Acts, such as GLBA - Gramm-Leach-Bliley Act, HIPAA - Health Insurance Portability and Accountability Act, SOX - Sarbanes-Oxley Act and the applicable Cisco solutions to each of these regulatory compliance and legislative acts in a clear, descriptive manner. Specific attack vectors and mitigation techniques are described through vulnerability, threats, and exploits that are a very common threat to today's networks.In addition to describing the risk assessment, specific solutions and mitigation techniques are offered to offset these threats.A security incident response methodology discusses the specific steps which helps prepare for any security event. This book is an excellent security reference, possessing both great scope and great depth, which is difficult to achieve in one book for such a large field. The structure is very good, starting with an overview of security, providing the objectives of it, the reason behind it, the 'Why'. This is followed by the 'How' where it gives clear and concise overviews and explanations of the multitude of technologies complete with configuration examples and good use of diagrams and screenshots. Every chapter has a very helpful list of references for even more information. Advanced topics such as Network Admission Control (NAC), Security Monitoring and Correlation (MARS), and Attack Vectors and Mitigation are covered. Finally the book closes with the business side including security management, explanation of policies, frameworks, governance and the myriad of regulations. As part of my preparation for the CCIE Security Written exam, I read this book and found it to be invaluable. I highly recommend this book for not just for CCIE preparation but for all levels of readers looking for one of the best books on network security. CCIE Routing and Switching Exam Certification Guide, Third Edition, is a best of breed Cisco exam study guide that focuses specifically on the objectives for the CCIE Routing and Switching written exam. Senior instructor and best-selling author Wendell Odom shares preparation hints and test-taking tips, helping you identify areas of weakness and improve both your conceptual knowledge and hands-on skills. Material is presented in a concise manner, focusing on increasing your understanding and retention of exam topics. CCIE Routing and Switching Exam Certification Guide, Third Edition, presents you with an organized test preparation routine through the use of proven series elements and techniques. “Do I Know This Already” quizzes open each chapter and allow you to decide how much time you need to spend on each section. Foundation Topic sections present detailed overviews of all exam objectives. Key Topic icons allow you to identify and quickly review the most important exam topics. Foundation summaries reinforce key exam concepts with review exercises and important tables. The companion CD-ROM contains a powerful testing engine that allows you to focus on individual topic areas or take complete, timed exams. The assessment engine also tracks your performance and provides feedback on a chapter-by-chapter basis, presenting question-by-question remediation to the text and laying out a complete study plan for review. Well regarded for its level of detail, assessment features, and challenging review exercises and practice questions, this completely revised and updated third edition helps you master the concepts and techniques that will enable you to succeed on the exam the first time. CCIE Routing and Switching Exam Certification Guide, Third Edition, is part of a recommended learning path from Cisco that includes simulation and hands-on training from authorized Cisco Learning Partners and self-study products from Cisco Press. To find out more about instructor-led training, e-learning, and hands-on instruction offered by authorized Cisco Learning Partners worldwide, visit www.cisco.com/go/authorizedtraining. Wendell Odom, CCIE No. 1624, has been in the networking industry since 1981. He currently teaches QoS, MPLS, and CCNA courses for Skyline Advanced Technology Services (http://www.skyline-ats.com). Wendell has worked as a network engineer, consultant, systems engineer, and as an instructor and course developer and has taught authorized Cisco courses for the majority of the last 14 years. and more than 250 practice questions for the CCIE Routing and Switching written exam, all available in study mode, test mode, and flash card format. 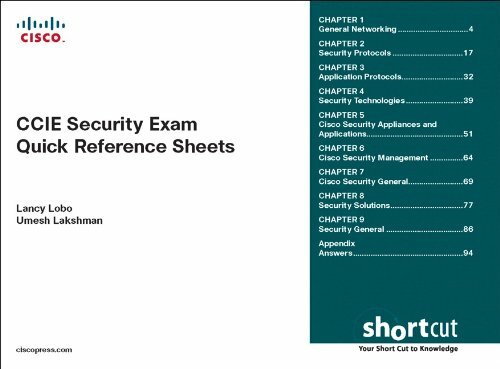 This volume is part of the Exam Certification Guide Series from Cisco Press. Books in this series provide officially developed exam preparation materials that offer assessment, review, and practice to help Cisco Career Certification candidates identify weaknesses, concentrate their study efforts, and enhance their confidence as exam day nears. 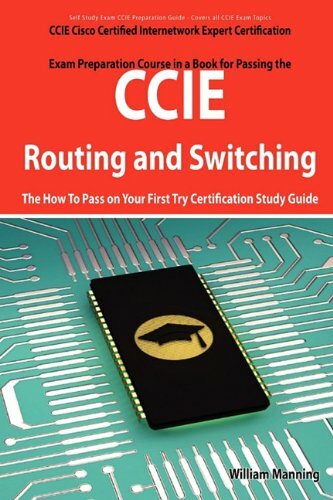 CCIE Routing and Switching Exam Certification Guide (3rd Edition) unlike some Cisco Press publications, is well written and actually has a voice.Just being a CCIE isn't necessarily all the qualification required to pen a technical book--although you may think so if you can slog your way through some of the recommended texts for other certifications. While not designed to teach the fundamentals of routing and switching, this Certification Guide is also useful as a reference source as it concisely provides a good level of detail for each of the topics covered. As noted in other reviews, this edition does seem to have more than its share of typos but the online errata has been actively updated to correct most if not all of them. I would definitely recommend this guide for all of you who have embarked on the journey towards the CCIE Routing and Switching certification. Hi, this book has many errors in the examples given, which often leads to confusion. Not sufficiently detailed in many of the sections, so if you have no prior knowledge of certain subjects to suggest others as support. Still remains a complete book to prepare for the exam so that I recommend. I have been enough to pass the written examination. This is a tough topic to jam into one book but Wendell Odom did just that. The target of this book is someone is preparing for the CCIE Written exam and it is not intended to give a full depth of knowledge on all topics. In fact in one case Mr Odom flat out says he are not going to cover much on frame relay because most engineers are very familiar with the topic. 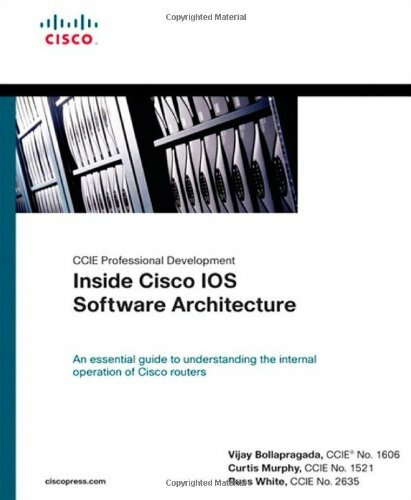 Also typical Cisco Press books end with a review of the topic covered in that chapter but this one does not, in basically all chapters he introduces something new with minimal detail. I say all that to point out you have to make sure you are the intended target, someone close to taking the CCIE Written. This will not give you enough details on its own but its a great read. Also the review sections are great knowledge builder because they give you terms you need to know and the CD includes blank forms for you to fill in help build that knowledge. I definitely say this a book you want to read on your way to a CCIE. I found it to be very informative will be reading it again along my to being a CCIE. The only complaint I have is that there are a number of typo's (as many tech books have) but this is the 3rd edition and I would hope most would have been fixed by now. The Voice track concentrates on voice solutions for the enterprise and includes subjects such as Quality of Service, MGCP, Call Manager (Cisco's VoIP PBX), Cisco Unity (Cisco's Unified Messaging platform), Unity Express and IP Contact Center Express. Most candidates pass the CCIE Voice certification after three or four lab attempts, but there have been cases in which candidates pass after more than six attempts. The low passing rate is attributed to the difficulty of the exam questions as well as the lack of time to complete everything in the allocated eight hours. As such, the lab exam is as much a test of time management and planning as it is a test of technical expertise. This self-study exam preparation guide for the CCIE Cisco Certified Internetwork Expert certification exam contains everything you need to test yourself and pass the Exam. All Exam topics are covered and insider secrets, complete explanations of all CCIE Cisco Certified Internetwork Expert subjects, test tricks and tips, numerous highly realistic sample questions, and exercises designed to strengthen understanding of CCIE Cisco Certified Internetwork Expert concepts and prepare you for exam success on the first attempt are provided. Cisco Certified Internetwork Expert (CCIE®) is the highest level of technical networking certification offered by Cisco. Put your knowledge and experience to the test. Achieve Cisco CCIE certification and accelerate your career. This book includes new exercises and sample questions never before in print. Offering numerous sample questions, critical time-saving tips plus information available nowhere else, this book will help you pass the CCIE Cisco Certified Internetwork Expert exam on your FIRST try. Up to speed with the theory? Buy this. Read it. And Pass the CCIE Exam. Nothing's more central to the Internet than the TCP/IP protocol stack, so internetworking engineers need to know--or have access to--as much information about it as possible. That's the function of Routing TCP/IP, Volume II, an encyclopedic reference that covers pretty much every aspect of TCP/IP internetworking in deep, practical detail. This is one of the books that working experts should always have at hand, and one of the best choices for people studying for the higher-level Cisco certification examinations, especially the Cisco Certified Internetwork Expert (CCIE) laboratory protocols. Jeff Doyle and Jennifer Carroll, both CCIEs, share their background knowledge and practical wisdom in nearly 1,000 information-dense, hardbound pages. I am kind of amazed to see how introducing a new portion called "Cisco Core Knowledge" to the CCIE lab test can persuade people to return to old days where this book was known as one of the ultimate CCIE R&S resources! anyway even today (Q2 2009) it comes handy for the Lab and CK preparation. If I have to pick the golden chapter obviously I'd go for the BGP chapter where the topic is explored very nicely. However, it doesn't mean it's got all CCIE-required BGP tips in it but can easily cover up to 70% of what you need to learn for the EGP section of the test. The NAT section is OK with several important (and well explained) examples (usually with nice diagrams). To be honest I read through the Multicast section once but didn't find it very easy to understand and eventually had to use other Cisco press books. Finally, again my big plus for these two books (vol 1&2) undoubtedly is given to the examples presented in various chapters. Extremely useful. I vouch that this book is a must have for anyone, not just for preparing for the CCIE (R&S) but as a great reference material as well. This will truly provide with you with a greater insight into the concepts related to BGP, NAT and multicast. "Routing TCP/IP, Volume II" by Jeff Doyle and Jennifer DeHaven Carroll picks up where "Routing TCP/IP, Volume I" left off. And, like the first volume, this volume is an essential "must read" for any aspiring CCIE-candidate. The book is divided into two sections, Exterior Gateway Protocols and Advanced IP Routing Issues. The first section provides an historical review of Exterior Gateway Protocol (EGP), an introduction for Border Gateway Protocol version 4 (BGP), and finally details on configuring and troubleshooting BGP. As with the first volume, numerous configuration and troubleshooting examples and exercises are included. However, one flaw is that the student will need twelve routers to actually stage the configuration example / lab at the end of this section. The second part, Advanced IP Routing Issues, covers a variety of topics, although Multicast received the bulk of the attention. The Multicast chapters are concise, well written, and easy to digest and understand. Other topics include Network Address Translation (NAT), IPv6, and Router Management. However, since the initial publication date (2001), Cisco support for IPv6 has matured, making the chapter here a bit outdated. In fact, the Second Edition of Volume I does a much better job of incorporating IPv6 throughout. Also, I felt the chapter on Router Management was a bit light and was left with the impression that is tossed in at the last moment as a sort of "filler". The reader should definitely make sure that he or she is comfortable with the topics presented in "Routing TCP/IP, Volume I" before delving into this book. Concepts covered in the first volume, such as Interior Gateway Protocols (RIP, OSPF, EIGRP) and the fundamentals of route redistribution, are referenced throughout this volume. If you do not completely understand the topics covered in Volume I, you will likely have a difficult time grasping the topics and concepts covered here in Volume II. All in all, a very good book for a student working towards a CCIE. You will likely need to augment the BGP coverage with Halabi's "Internet Routing Architecture". When I first bought the book a few years back, I would have given it 5 stars. However, given some of the outdated topics I mentioned earlier, I've knocked it down to 4. A Second Edition refresh, similar to what was done for "Routing TCP/IP, Volume I", would likely bump it back to 5 stars. Good luck! Best-of-class book for external routing! CiscoPress's "Routing TCP/IP - Volume II" by Doyle and Carroll is one of the `must-have' books on any CCIE's R&S bookshelf OR any network admin who needs to understand the intricacies of external routing. I have referenced this book many times for my preparations for the R&S lab and real-world implementations. The book's first 320 pages are dedicated to BGP.I believe this book does the best job at preparing a R&S lab candidate for BGP (better than Halabi's book).For instance, the book does an excellent job at describing the issues and nuances of IBGP and IGP synch starting on page 118.The BGP configs are complete and complex - you will be diving into some of the more arcane commands quickly (for instance - aggregate-address, as-set, backdoor). The NAT section is probably the weakest of the subjects covered in this book, and can be found in other CiscoPress books.Still, the information presented here will be enough for the R&S lab.The next 3 chapters are devoted to IP multicast.Again, as with the BGP section, I do not believe you will find better material for the R&S lab in any other CiscoPress book (even considering Williamson's multicast book).I am admittedly weak in multicast, and Auto-RP did not `click' for me till I read this book. If I picked up this book, and dangled it, I would probably have about 20 pages of notes fall out of the book.The book crams in a lot of information (even considering that it fills more than 900+pages).I consider this book one of the `holy trinity' of R&S books (along with Doyle's Routing TCP/IP - Volume 1 and Clark's LAN Switching book). Cisco CCIE Storage Networking Certifies expert-level knowledge of intelligent storage solutions using multiple transport options over long distances. I've already pass in the CCIE Storage Networking Written Exam and I was hoping that this book could help me in studying for the Lab Exam but it was not. There are only a few CCIE storage books. This book will serves as an introductory book, but not a full prep guide. You will need to get supplemental books to prepare for the exam. The explosive growth of the Internet economy over the past several years and new IP-based enterprise applications has heightened requirements for continuous availability of mission-critical data. Today's network administrators and managers are under big pressure to satisfy ever-increasing demands from customers, suppliers, and employees for 100 percent network resource availability and access to applications and data. The end result is that the cost of a network security breach has never been higher. Accordingly, the demand for networking professionals with expert-level network security configuration and troubleshooting skills is also great. The Cisco Systems CCIE Security certification is a prestigious program that sets the professional benchmark for internetworking expertise, validating proficiency with advanced technical skills required to design, configure, and maintain a wide range of network security technologies. 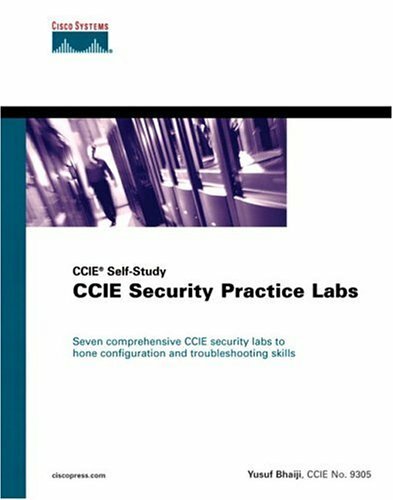 CCIE Security Practice Labs provides a series of complete practice labs that mirror the difficult hands-on lab exam. Written by a CCIE Security engineer and Cisco Systems CCIE proctor, this book lays out seven end-to-end scenarios that are both complex and realistic, providing you with the practice needed to prepare for your lab examination and develop critical-thinking skills that are essential for resolving complex, real-world security problems. While many engineers are able to configure single technologies in standalone environments, most will struggle when dealing with integrated technologies in heterogeneous environments. CCIE Security Practice Labs is part of a recommended study program from Cisco Systems that includes simulation and hands-on training from authorized Cisco Learning Partners and self-study products from Cisco Press. Companion CD-ROMThe CD-ROM contains the solutions to the seven complete lab scenarios in the book including configurations and show command output. This volume is part of the Cisco Press Practical Studies Series, which offers readers a means to apply their theoretical knowledge through hands-on lab scenarios for key networking technologies. This unique approach enables readers to practice and hone their internetworking skills while preparing for Cisco certification exams. Not being a Cisco expert myself I can't speak much on the technical accuracy of the book. There are some reports out there of mistakes in some of the labs, however CCIE classes and boot camps can cost thousands of dollars and many CCIE workbooks and preparation programs cost well into the hundreds of dollars. For the $50 price of this book I think a few mistakes can be tolerated. In the end, even if there may be a few mistakes, there are seven practice lab scenarios to help you learn and practice configuration and troubleshooting of solutions. The accompanying CDROM contains the solutions to the lab exercises including the configurations and the output of the SHOW commands. In my experience it is possible that a few mistakes here and there may actually make the experience of using a book like this even better. The process of troubleshooting to determine what the mistakes are generally serves to strengthen the information and cement it in your mind. I recently read the book titled "CCIE Security Practice Labs (CCIE Self-Study)", by Yusuf Hussain Bhaiji.ISBN: 1587051346.This is a great book to use for preparing for the CCIE Security Lab. The main benefit that this book has to offer is that it allows the reader to think outside of the box and configure different Cisco network security devices and features in a way that would otherwise be overlooked. The book is made up of 7 practice labs which are fairly equal in complexity.As the author states in the book, the labs are relatively straight forward, however it's the detail that one needs to pay attention to in order to help reinforce skills needed to pass the CCIE Security Lab. Technologies covered in this book include a fairly good portion on general network features such as IP routing protocols (OSPF, EIGRP, BGP and RIP), a few data link layer WAN technologies (ISDN, Frame Relay), Firewall and Intrusion Detection scenarios as well as Authentication, Authorization and Accounting (AAA). The labs give the reader a mixed bag of scenarios that is designed to challenge not just the configuration of each individual piece of the architecture, but more so the configuration of all features and protocols in a given unlikely scenario. I like the way in which the book is laid out, because it is designed to allow the reader to really think through how to accomplish a given task by presenting the task in loose pseudo code verbiage. There are adequate diagrams and screen prints that help map out the objective of each lab.Each lab has a diagram associated with it to help the reader understand visually, what is being accomplished.I think this helps a great deal when mapping the lab to ones memory. After each lab, which is broken out into sections, the authors gives hints on how to accomplish what has been ask of the reader to build in the lab environment.Again, I like the format, because the answers are not given away fully.Causing the reader to comprehend what they are doing and not just pasting in configurations.However, for those who can't stand digging for answers, and like the answers upfront, a CD-ROM that contains the entire configuration for the lab is included with the book. Each section of each lab is broken up into tasks and given a weight or points on successful accomplishment of that particular section.According to the word on the street, in the real CCIE Security LAB, if you miss one little detail on a section, you don't get any credit for that section.So you night have the section 75% right and 25% wrong, but you get 0% credit for that section.Which make the CCIE Lab a toughie.That's why it's all about the details, details, details. CD-ROM contains lab configurations, but they're all contained in one ACSII file.Have to cut and paste out configuration and look for the output for each configuration.Would be better to have the output and configuration in separate files for separate devices.Each lab is kind of jammed into one file.Not pretty for viewing, but effective. Overall I think this a good book to compliment Cisco Press strong documentation relating to network Security and to help someone achieve the coveted CCIE certification. I did my CCNP about 2 years ago. Have a big Cisco Lab at home. For long time I was loking for a book that can give me a real feel of actual CCIE labs. I found that in this book. The CD has all the answers for the all 7 labs. Since I have not attempted the exam yet, I don't know how close they are from real exam. I am a CCNP, CCDP and getting experience at work in Cisco ops. I am slowly pursuing CCIE as time permits. I have brought this book and any other Cisco titles that will help me practice, practice, etc. So I have not gone thru any or all the labs. In fact I am currently pursuing the CCSP this year and practicing on my router/switches as time permits. I have also ordered the CCIE practice R/S coming soon, and may pursue that first since I have much more gear. I don't have the PIX, VPN .... which is around another $5-7K but pretty close to what I need for ccie r/s. So why am I giving it 5 stars because other books/workbooks cost many times more than this. So the one interview which gave this a bad rap, he has dug into it and knows but this type of material usually is many times the cost of this book. If you have the gear, want to pursue ccie its worth it. Otherwise ccie prep classes $2-4k, ccie workbooks $hundreds of dollars, so these Cisco CCIE practices labs, practicals are GREAT as far as I am concerned. Its quite possible and probably true that they contain "errors" but us so called CCIE candidates are supposed to be "experts" or are we just looking for something so we can just follow the cookbook and earn the CCIE title. I for one want to work thru the configurations and figure it out to become a CCIE. Either I have what it takes or not. If I can't figure it out then I don't deserve the title. This book is completely out of date.It was relevant 3 yrs ago but it will not get you 20% of what you need to pass the current CCIE Security 2.0 exam. Information within is very broad and generalized - nothing like you'll experience on the test itself. Also, the test software from Boson is a complete joke.1 in 10 questions are wrong.In other words, what they list as the correct answer is not always the case.Also, you'll find that you might click on an answer and then it tells you it's wrong and that the right answer is the same as the one you picked - only instead of 'A', it's 'C' for example.Sigh..... what a waste of $50. A woefully, inadequate "study guide" for Cisco's premier certification. The CCIE Security Exam Certification Guide glosses over"topics" listed in the CCIE version 1 blueprint. Each section provides a high level view of a subject. This book is riddled with configuration errors and lacks depth. While not study guides, other books like Network Security Principles and Practices -- Saadat Malik, Network Security Architectures -- Sean Convery and Cisco Router Firewall Security -- Richard Deal were excellent, detailed and fun to learn from. Benjamin's description of cryptography and related protocols is terrible and should be avoided. A study guide should list salient features of a technology, not just fillers that will confuse the reader. I found chapter 4 (Security protocols) weak and skipped reading this chapter all together, preferring other, *better* tomes - Malik for example. Examples - The ESP Frame Format figure is incorrect. In the IPSec section, Benjamin writes "You can tunnel any form of data across the IPSec tunnel, such as IP, Novel IPX, or AppleTalk." Not without GRE to first encapsulate the non-IP traffic. IPSec works only on IP traffic and non-IP traffic should be encapsulated (recommended GRE encapsulation) prior to IPSec. In chapter 5, Security Applications, Benjamin writes the following on VPN Concentrators "Cisco makes a number of recommendations in its SAFE Blueprint, but in general requires that the VPN Concentrator be located behind a Cisco PIX Firewall on the inside interface where the DMZ is located. The Cisco SAFE Blueprint has a number of recommendations based on network size and appliances, though". The SAFE blueprint does not recommend having a VPN device beyond a Firewall. Common sense would dictate that having this scenario would require opening up the Pix for all encrypted traffic. I truly hope that Benjamin would write a far better book for the CCIE v2.0 blueprint. 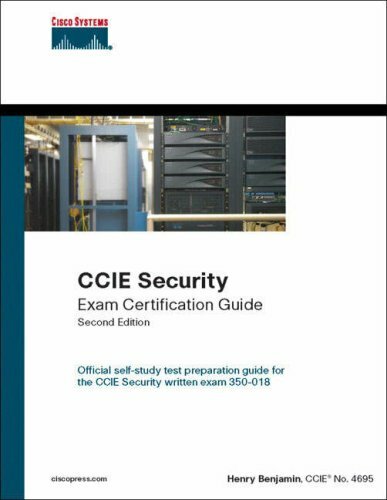 It's a good book with most of all topics to someone make the CCIE Security written exam, but not so deep. As another reviewer put it: puddle depth. As is not uncommon with most CCxx prep books, Benjamin's CCIE Security coverage is barely broad enough and nowhere deep enough. I'm using this more as a basic overview for a topic, then it's off to the Cisco documentation and lab work for a few hours to figure out how the thing really works. Oh I wish for someone like Odom or Doyle/Carroll to write a CCIE Security book! It'd be two or three volumes, but it'd be worth the money, unlike "CCIE Security Exam Certification Guide". Buy it second hand, or better use Safari - at least you'll not waste a tree. I obtained a copy of Henry Benjamin's "CCIE Security Exam Certification Guide" (ISBN 1587201356) to complete my final preparation for the CCIE Security Written Exam. Contrary to a few other reviews, I found this book to be extremely valuable for my final review. This book is exactly what it states in the title, a study guide for the exam. It is not a detailed analysis of security architectures and principles. It should not be viewed a CCIE Security "bible". Rather, this book should be used by a CCIE Security candidate only after he or she has read most of the other security related books listed on the CCIE Written Roadmap on Cisco's website. I found the layout of the book to be beneficial for the CCIE Security candidate. Each chapter opens with a "Do I know this already?" quiz. The quizzes are helpful in assessing the reader's knowledge on the chapter's topics. Therefore, the reader will be better prepared to focus on the areas where he or she may be weak. The chapters then jump right in to its particular topic, presenting the material in a concise and articulate manner. The chapters close with a summary, questions and answers, and references to additional information. Finally, the book includes a testing engine as well as an electronic version of the book on CDROM. I appreciated the "bonus" CCIE Security and Routing & Switching lab scenarios at the end of the book. A competent and confident Cisco engineer can never get enough hands-on practice lab scenarios to sharpen and keep ones skills fresh. Again, I must emphasize that this book is a culmination of the CCIE Security candidate's exam preparation, not a starting point! If you are just starting your CCIE journey, I strongly recommend that you review the written exam blueprint on Cisco's website and begin with the Doyle, Malik, and De Laet and Gert Schauwers books, to quickly name a few. I am confident that this book assisted me in conquering the CCIE Security Written exam! 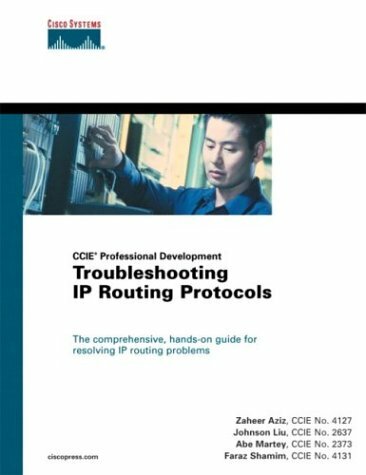 CiscoPress's "Troubleshooting IP Routing Protocols" by Shamim, Azis, Liu and Martey is mislabeled.CiscoPress has labeled this book as part of their `CCIE Professional Development' series - I really do not see the value of placing this book in the same vein as other CCIE books in the series (such as Doyle, Solie, & Clark).However, having been employed as a Network Administrator for a number of years, the book does help troubleshoot and isolate routing protocol issues. Each major IGP (RIP, IGRP, EIGRP, OSPF & IS-IS) along with PIM and BGP is discussed at depth. Each routing protocol is dedicated 2 chapters - one chapter discussing the protocol and one chapter discussing troubleshooting methodologies.The troubleshooting chapters start out with flow charts that can help isolate the issue.Too be honest though, the flow-charts are lacking in depth, and I found only helped verify simple routing issues.The book is also missing a much needed chapter on route redistribution. There are not that many typos in the book.I give this book four stars as it takes a unique approach to troubleshooting routing protocol issues.However, I fail to find the reason this book needs to be on a CCIE's bookshelf. Good book on IP routing troubleshooting. This book is so far is the best out there on troubleshooting IP routing protocols. If you want to learn the theory behind each modern routing protocol (RIP, EIGRP, OSPF, IS-IS, and BGP), and therefore spend less time on troubleshooting in the first place, check out "Cisco IOS for IP Routing" by Andrew Colton. These two together should take you a long way to a good understaning of Cisco IP routing. Absolutly the best book on the topic. Authors, thank you for making my troubleshooting life easier!! This is the best book I have seen in troubleshooting.Especially covering a tough topic like IP routing protocol.I particularly like the error message in each routing protocol.This allows me to understand the meaning of the error message that is not covered in any of the Cisco manuals.This saves me the trouble of calling Cisco TAC.This is a must book to have if you are in Network operations. Absolutely wonderful book to have. 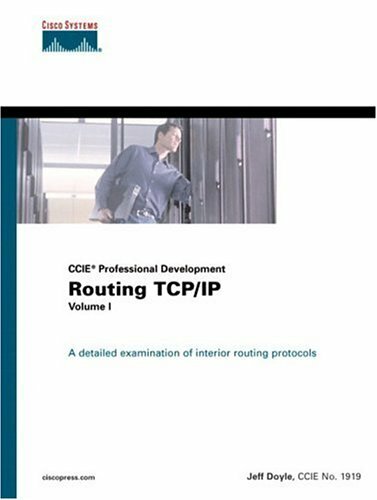 CCIE Professional Development: Routing TCP/IP, Volume I, takes readers from a basic understanding of routers and routing protocols through a detailed examination of each of the IP interior routing protocols: RIP, RIP2, IGRP, EIGRP, OSPF, and IS-IS. In addition to specific protocols, important general topics such as redistribution, default routes and on-demand routing, route filtering, and route maps are covered. The book emphasizes techniques for designing networks that efficiently utilize and integrate the IP routing protocols. You will gain a deep understanding of IP routing protocols and learn best-practice techniques for implementing these protocols using Cisco routers. As well, this book will help you master the skills necessary to become an effective CCIE. Each protocol-specific chapter opens with thorough and lucid coverage of the protocol's capabilities and characteristics. Following sections contain configuration and troubleshooting case studies that cover Cisco specific configuration of the protocol and all commands available for it on the most recent Cisco IOS Software version. Finally, review questions and configuration and troubleshooting exercises on each protocol provide an opportunity to practice for the CCIE exam. The Cisco effort to facilitate the creation of competent network operations center (NOC) and information systems (IS) staff is exemplified in its CCIE program. To support these efforts, Cisco Press is working closely with CCIE program management to create information products that help build the knowledge and expertise of NOC and IS professionals, as well as provide up-to-date, accurate information on technologies addressed in the CCIE program. The CCIE Professional Development Series volumes are based on CCIE program guidelines from Cisco. This series is a set of technology-specific volumes designed to meet the needs of CCIE candidates. This all-encompassing TCP/IP text defines completeness withits 1,000-plus pages and hundreds of configuration screens, exercises,charts, tables, and references. Though initially overwhelming, suchthoroughness is what's demanded of those who ultimately pass the CiscoCertified Internetwork Expert (CCIE) exam, the bruising test for whichRouting TCP/IP, Volume 1 serves as preparatory material. Such a goal is evidenced in much of the three-part book's design. Forexample, nearly every chapter includes some combination of recommendedreadings, review questions, configuration and troubleshootingexercises, case studies, and summaries. In addition, there arenumerous appendices devoted to answers to questions and exercisesolutions as well as one that outlines exam preparation tips. This book is the ultimate Networking Citadel of reference for any serious Networking professional, I consider this book a must have! I have waited to grab a personal copy for almost 18 months and now I virtually live with it every day! I wish I had it before I took my CCNA exam. But I am really enjoying it and using it for my CCNP preparation. I have the hardback version and I absolutely love it! The only book I like more is "Interconnections" by Radia Perlman.The two books are a must for any network engineer. However, the Kindle version was a real disappointment because Cisco Press didn't enable hyperlinks in the table of contents which caused me great pain.The search feature worked however I didn't care for it. I'm giving only two stars because the hyperlinks don't work. Routing TCP/IP Volume I Still Awesome and relevant!!! I recently purchased this book based on the rave reviews even with an updated second edition off the press. I can honestly say that this book is Awesome in detail and explanation and is still extremely relevant to understanding the how too's and processes involved in routing tcp/ip. The most amazing feature about this book is how well explained and the book makes topics that would normally seem dificult or confusing easily understood, in other words grandma could learn how routing tcp/ip works from reading this book! If any book was ever considered as the MUST HAVE BIBLE for Interior Routing Protocols - then Jeff Doyle's first effort on IGPs is THE book (how many cliché's do you want in one sentence)! !The book goes through at a very even pace - dissecting and describing the majority of both open-standard IGPs (OSPF, RIP and a little on ISIS) and Cisco-proprietary IGPs (IGRP and it's beefier brother - EIGRP).The book also includes some invaluable appendixes - including tutorials on working with Binary and hex. I cannot imagine there are many CCIEs out there that do not have this book on their bookshelf. Prepare for the one-day CCIE lab exam with TEN full lab scenarios,written by a CCIE Lab Proctor and approved by the CCIE team atCisco! CCIE Routing and SwitchingPractice Labs helps you prepare for the CCIE Routing and Switchinglab exam, with practice to hone your skills and gauge your readinessby completing self-contained labs. The book helps CCIE candidateslearn complex techniques and troubleshooting methods. It contains tencomplete practice lab scenarios, each one covering in-depth questionsfor all technologies tested in the Routing and Switching track,including Cisco device operation, general networking theory, bridgingand LAN switching, IP, IP routing, desktop protocols, quality ofservice, WAN, LAN, security, multiservice, and IPmulticasting. Each complete lab scenario is presented in examstyle format to mimic the 8-hour lab exam. Each lab begins with anintroduction, including an overview of the lab, equipment list, andinstructions for completing the lab. A section on setting up the labfollows, and after each lab there are configurations and routingtables with the required answers.A scoring system lets you know ifyou are ready to take the actual exam or need to continue yourstudy. In addition to the practice labs, the book also contains testpreparation advice and resources. The CCIE is a moving target. I may be stating the obvious, but before you plunk down this kind of money and spend that kind of time, you might want to check the Cisco web site and see how many chapters are still relevant.At this point the chapters on ATM and DLSw are not. 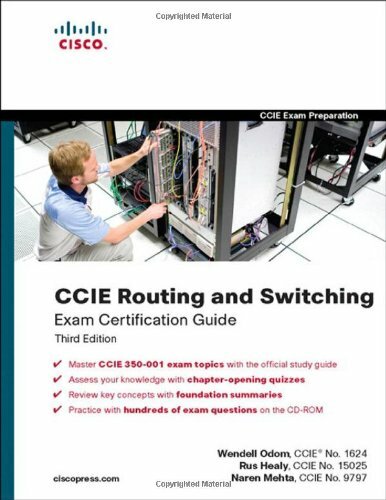 Since the CCIE R & S lab changed in January, lots of things in this book are no longer on the current exam. That includes Voice over IP, ATM, DLSW and ISDN. Given that most people don't have ATM switches or ISDN simulators in their home labs anyway, that makes a good bit of this book no longer relevent to exam prep. Pretty expensive renting an on-line rack to practice technologies not on the exam any more. It would be alot of work to re-write the labs yourself to take out the stuff no longer tested. For example, you could replace ATM pvcs with frame relay pvcs, but then you would need to redefine the solutions yourself,also. Cisco's CCIE Routing & Switching Lab has always been one of the most coveted certifications in the Networking industry.While CiscoPress publishes a wealth of material concerning the CCIE and the different areas of testing IGPs, BGP, QoS, security, etc..., the same cannot be written of labs to test one's knowledge of the various subjects.I feel "CCIE Routing and Switching Practice Labs" by Duggan and Gorito is an excellent reference and valiant effort by CiscoPress to resolve this gap. I have studied most of the major 3rd party vendors study aids for the CCIE lab (InternetworkExpert, NMC, IPExpert and ccBootcamp).Even considering the 100s of labs I have studied, I believe this book does something none of the other study materials do - and that is mimic the questions that are asked on the CCIE lab.Each chapter is broken down in two areas - the test and the answers.The difficulty of the exams is not as complex as you will see on the exam - but it is close.If the CCIE had a difficulty rating of 10, I would place the difficulty of this book at about a 6 - 7 (I would place most 3rd party vendors advanced study material at an 11 - yes, harder than the real lab). -on page 50, the 2nd route-map in example of 1-40 should be set to 20, not 10. -on page 197, example 3-93 should include to deny tcp and udp 445 as mentioned in the first paragraph. There are many books a CCIE candidate will need on his shelf to help attain their digits.This is the rare CiscoPress book that the candidate should use only when they are near the culmination of their studies. I never understand why Cisco does not want to publish some newer editions of this invaluable book! I bought this item as a reliable and recommended supplementary resource to brush up on my switching skills for R&S CCIE lab test 2007-2008, yet found it almost "useless". Explaining some concepts in more details than other Cisco press books, this book suffers from a big problem: almost all examples are presented in an old fashion which makes them unusable for new exams where "set based" and other dated CAT commands can no longer be thought of as valid exam topics. Needless to say, the same problem will be experienced by readers when they try to get them implemented in real world. It sounds like a big drawback especially when it comes to CCIE lab preparation tools, as this book is supposed to be. What I needed for the test was a concise well-designed structure in terms of main concepts e.g. STP (it did have) and many complex and reliable configuration samples which I never could find in this edition (back in years ago, not surprising at all). By the way, If you are a great Set-to-IOS converter, you might enjoy those examples. Nails Spanning Tree protocols (particularly in Cisco switching networks) more thoroughly than any other text except possibly Perlman. Unfortunately this book was published in 1999! I think it's about time to drop the MPoA and token-ring information, and cut this book down to 400 pages or dramatically expand the coverage of all permutations of Ethernet switching. More than half the book is irrelevant to most users, and is thus grossly overpriced. Without this I'd give it five. One hopes that with Cisco's new Ethernet switching platform being released to replace the Catalyst 6500s, this book will eventually follow, because I will definitely buy it. A great resource on a little understood subject. CiscoPress's "Cisco LAN Switching" by Clark and Hamilton is one of the classics of Networking.For years, this book has been considered the "Bible" or the "Source" for LAN switching topologies. Having written that, I feel that LAN Switching had covered a topic to a degree where it wasn't necessary to write another book on the same subject.Most Cisco Networkers live at Layer 3, and moving down to Layer 2 (and, in particular) STP is both a mystery and, perhaps, beneath them (both literally and figuratively - on the OSI stack).For a lot of people, Layer 2 is plug-n-play (dangerous indeed! ).As Cisco's main switching workhorses (6500s) increase in functionality - the lines between layer 2 and layer 3 start to get hazy.But fear not - the layers are still distinct!LAN Switching does a superb job at dissecting the vagaries of STP - along with discussing VTP and trunking. 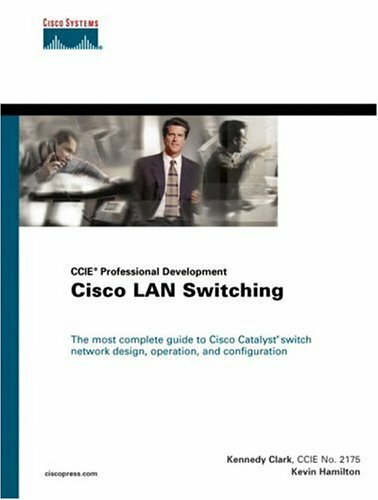 For 99% of people requiring LAN skills (both CCIE candidates and networkers), this will be the resource to put on their bookshelf.And "Cisco LAN Switching" by Clark and Hamilton will fill this role nicely for them. This book provides great information on the core switching concepts.The Spanning tree section is excellent.Unfortunately the text's age is starting to show.Most of the examples are in CatOS. Cisco LAN Switching by Kennedy Clark and Kevin Hamilton is considered a definitive guide to Cisco switching - and rightly so. The book contains an exhaustive presentation on all aspects of switching - from the basics of switching technologies, to the protocols and algorithms used in campus switching, to real-world designs of campus switching environments. All this with an added bonus of tidbits of humor thrown into the discussion of serious, no-nonsense topics! The book is surprisingly well written and easy to understand for readers who have a basic understanding of switching and routing in the Cisco world. The formatting in the book follows the standard Cisco layout for advanced level books. The headings, diagrams, tables, and notes are laid out in a clear and easy-to-scan format. Each chapter ends with review questions for those who wish to test their understanding of the material - these can prove particularly useful for the readers who may be studying for one of the Cisco certifications. The index is a crucial part of any technical book. Those of us working in the field can appreciate the importance of having a detailed and useful index when trying to put out fires at the workplace. This book offers a comprehensive, detailed index - spanning over 30 pages -- which provided me with useful knowledge on the topic(s) that I was trying to look up. While the book claims to be a switching resource for those studying for the advanced Cisco certifications, I personally selected the book in order to help me in my work environment. It has served its purpose very well. The sample configurations given throughout the book for various situations were particularly helpful in tying the theory to the practical and especially helped in troubleshooting some of the issues I encounter every day. Presentation of the inner workings of some of the advanced material like the Spanning Tree protocol was surprisingly detailed and practical, while being easy to understand at the same time. I have not read any other book that covers this topic effectively with such detail. The only suggestion I have for the authors is to look into writing an updated edition. Some of the topics - like layer 3 switching - do not seem to cover the latest switch types offered by Cisco. For example, the Cisco 3550 layer 3 switch, a popular and important milestone in the Cisco switching hierarchy, is not covered in any significant detail. CCIE certification is the most difficult and most rewarding of the Cisco® certifications. Although the professional and financial benefits of a CCIE are excellent, attaining this level of certification takes years of experience, study, and effort. Serving a dual role of networking reference guide for configuring Cisco routers and preparation tool for the CCIE Lab Exams, CCIE Practical Studies, Volume I, is an ideal resource to help you achieve and earn the coveted CCIE designation. CCIE Practical Studies, Volume I, provides you with the knowledge to assemble and configure all the necessary hardware and software components required to model complex, Cisco internetworks based on the OSI reference model-from Layer 1 on up. Each chapter focuses on one or more specific technologies or protocols and follows up with a battery of CCIE exam-like labs for you to configure that challenges your understanding of the chapter topics and measures your aptitude as a CCIE candidate. The final chapter of the book provides five CCIE "Simulation Labs." These labs not only test your knowledge but your speed as well-a crucial aspect of the new one-day format of the CCIE exam. Among the many resources you will need to study for the CCIE exam, you will find CCIE Practical Studies, Volume I, to be an indispensable preparation tool. This book is part of the Cisco Press Practical Studies Series, which offers readers a means to apply the theoretical knowledge they have accumulated from other sources through hands-on lab scenarios for key networking technologies. This unique approach enables readers to practice and hone their internetworking skills while preparing for Cisco certification exams. Preparing for the practical portion of the Cisco Certified Internetwork Expert (CCIE) examination, in which you have to configure and troubleshoot networks on Cisco equipment in a testing lab, can be scary. There's simply so much the test proctor can throw at you, and you have to be prepared for it all. CCIE Practical Studies, Volume I does a fantastic job of preparing you for much of what you can expect to see on the first day of your CCIE lab exam (when you build a system to specifications). Karl Solie, a CCIE himself, first approaches each subject on the CCIE syllabus with a quick academic overview ("Here's what frame relay is for," for instance, "and here's how Cisco equipment thinks of it"). That gives way to a series of examples ("Here's a typical set of customer requirements, and here are the IOS commands and configuration files that satisfy them"). Finally, a series of subject-specific lab exercises (which are shorter than a typical day-long CCIE assignment) drill you on the Cisco skills related to the technology at hand. Solie explains how he'd solve the lab--in wonderful detail--immediately after the pages that describe these small lab tasks. A great resource - but use with MUCH caution! CiscoPress's "CCIE Practical Studies - Volume 1" by Solie is a difficult book to assess.On one hand, the book does an excellent job at covering half of the topics that you will see on the CCIE lab at the time of the book's printing.On the other hand, the book is riddled with errors.Every page, almost every config needs to be examined, reexamined and then, perhaps, discussed on GroupStudy to verify.It is hard to trust such a book but at the same time impossible to ignore. * Page 344 - For Cisco LMI " LMI status information is sent on DLCI 0. "Not true - Cisco LMI is sent on 1023.And then the opposite with ANSI LMI right below Cisco LMI. * Page 518 - 2nd paragraph - "...snapshot routing can be used only with link-state protocols..."Not true - snapshot routing is used only with distance-vector protocols (like RIP). * Page 705 - 1st line - "For autosummarization to work properly, discontinuous subnets..." I believe the proper term is discontiguous. * Page 776 - When discussing what must match for an OSPF neighbor relationship to form, the book is missing that the stub area flag and MTU must also match. * Between 937 & 939 - completely ignore how they document NetBios and SNAP SAPs.This error is repeated throughout the book but can be verified on Cisco's website. And so on...But have written this, I will be surprised if many CCIE candidates don't have this book on their shelf.Chapter 2, on LAN protocols is very good (and not document elsewhere).Also, the chapter on ISDN is both of use in the lab and a good tool to use in the real world. This book is a very good source of information for setting up practice internet works for the CCIE hands on lab. I went into it as a possible study source for the written portion of the exam. I was able to glean some useful information from it but nothing I couldn't find in other books. It will definitely come in handy when I start setting up test equipment for the lab. The material is presented in a very understandable format. I especially liked the fact that the practice labs were grouped by technology. Starting with the basics, in chapter one, it builds up steam as it progresses through the different technologies. Each chapter provides a background and a lot of helpful information on how to accomplish the lab scenario. There are also pertinent troubleshooting commands when things just don't go the way they should. After each lab scenario the author provides a walkthrough of how to accomplish the lab. All this reading, lab setups and practice labs culminate in chapter 18. Chapter 18 is a series of labs that a CCIE candidate might face in the actual live CCIE lab. Each of the 5 labs goes over an equipment list, a pre-staging section then followed by the rules and the timed section. Answers are not provided for these labs but a link to a CiscoPress website is provided for you to check your work. I compared these labs with other lab workbooks on the internet and found that there is not much difference between the lab scenarios. Whereas the workbooks have close to 30 labs they can cost up to several hundred dollars. The labs to be found in CCIE Practical Studies Vols I & II will cost you much less and most likely get you to the same level of competence to attempt the live CCIE lab. This is an outstanding book. In fact the part 2 is also a winner. The examples and the explanations are outstanding. This book and together with the part 2 is an art by itself . I think some of the materials are from Cisco website but yet the explanations are very down to earth and well written. I consider Jeff and Karl to be my Gurus and hope I will meet them some day. 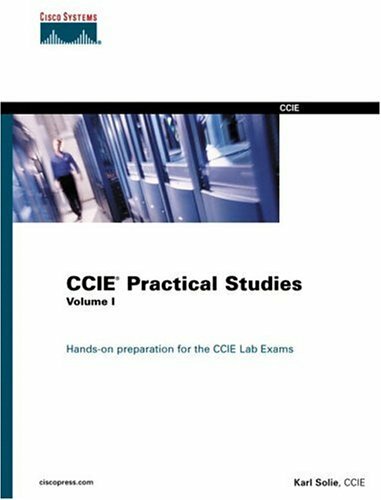 "One of the books you will need"
CCIE Practical Studies, Volume II leads CCIE candidates through the process of preparing for the CCIE lab exam by presenting them with a series of challenging laboratory exercises. A perfect companion to the best-selling first edition, this book provides coverage of CCIE lab exam topics not covered in Volume I, like the Cisco Catalyst 3550, route maps, BGP, Multicast, and QoS. Combined with Volume I, the CCIE candidate will get comprehensive coverage of the routing and switching portions of the Routing and Switching, Security, and Service Provider lab exams. The book begins with brief coverage of the core technologies required on the CCIE lab exam and includes suggested references for further reading. Laboratory exercises covering each of the core technologies follow, providing detailed guides to applying the technologies in real network settings. The final chapter of the book concludes with five hands-on lab exercises.These comprehensive practice labs include all of the technologies and gradually increase in difficulty level. They present readers with scenarios similar to what they will face on the actual lab exam. Study tips and test-taking techniques are included throughout the book. CiscoPress's "CCIE Practical Studies - Volume II" by Solie and Lynch does a good job at preparing CCIE Routing & Switching candidates for the CCIE Lab.While this book picks up where Volume 1 left off, this volume does a much better job at both documenting and displaying some of the more advanced requirements of the lab.It is also important to note that this book should not be used to first introduce yourself to a topic.The book requires you to be familiar with the topics discussed. The first chapter is a much needed resource on the 3550 Catalyst switch.Part 2 covers route-maps and policy-based routing.I felt the multicast section was weak but felt it was made up for in the section covering QoS.The last part is on BGP and an excellent companion to Doyle's coverage in his 2nd TCP/IP book.I would not recommend the labs at the back of the book - they are error prone. Page 389 - in the first sentence - the bandwidth should be 772 kbps - not 772 bps.There are actually multiple errors over the next few pages. Page 566 - the last line of the first paragraph - "... then the ORIGIN value is type 3, Incomplete. "The origin code is type 2 for incomplete. Page 737 - the aggregate-address should have included the `as-set' command. Weighing in at 1,000pages, it will take time to properly digest this book.I'm really at a loss as to whether this is a 4 or 5 star book.But considering the depth and breadth of coverage, it is nonetheless a book that must be read before the CCIE R&S lab.Overall, I expect to find this book on many a CCIE's bookshelf. to read on some of the topics listed in this book (see Halabi & Parkhurst for BGP) but the authors do add good examples to their explanations. The best part of the book is the route-filtering and the queuing chapters.The switching chapter wasn't all that bad either with a deep dive into Spanning Tree as well as the features of the 3550.I was impressed with the output of the show/debug commands which shows us that the authors actually tested their configurations and allows the reader to follow along even if they don't have real gear to test the scenarios out. Some of the material in the book was extraneous and felt a little like filler when reading it (the chapters on ATM and the Switching modes) but those were easily outdone by the BGP topic scenarios. The full scale labs at the end of the book were really good and tested potential candidates on core areas and would give candidates an accurate account of the type of scenarios they should know for the real world. CCIE Practical Studies Volume II is the latest in the CCIE Practical Studies series. This book is not just intended for individuals who have completed the CCIE written test, but for anyone who has advanced knowledge of networking theory. The book assumes you already have an understanding of routing protocols, WAN technologies, and LAN switching. Each chapter includes a section on theory but primarily focuses on the configuration aspect ending with several lab scenarios. CCIE Practical Studies Volume II includes five complete lab scenarios including the solutions on CD-ROM. These five lab scenarios are in addition to the regular labs at the end of each chapter. This book will especially appeal to those working towards their CCNP or CCIE, but also for anyone who is looking for extensive configuration examples of ethernet switching (3550), network access and propagation control, multicast routing, QOS and performance management, and advanced BGP configuration. Karl Solie and Leah Lynch do an excellent job of providing the user with a complete set of configuration examples within each chapter. Many books on the market focus on networking theory with basic configurations added to supplement the theory. Typically, the examples in other books are not very complex or useful for real world situations. CCIE Practical Studies Volume II provides the reader with complex solutions that more closely resemble the CCIE lab exam. In addition, the examples used in the book are more practical than those used in most books on the market. The majority of the exercises are easy to follow, but as I stressed in the first paragraph you should have a more advanced knowledge to understand the complete solution. In addition to the extensive Lab examples used throughout the book, each author has proven to write their specific chapters in a clear, consistent manner. Lynch wrote the QoS and BGP chapters consisting of the second half of the book. Although the majority of the BGP section is well written and thorough, I expected to see more details and examples in the BGP route policy chapter. As far as the other authors, the beginning of the book has a very good section on Route Maps and Policy-Based Routing. All chapters are easy to read and include additional references for further reading. I would recommend reading additional titles by either of the primary authors of this book. In summary, Solie and Lynch wrote a solid continuation of the CCIE Practical Studies series keeping on track with the CCIE lab outline. The book did not reveal any significant amount of errors as seen in other titles preparing you for the CCIE exam. As a result, you spent less time trying to understand the examples and correcting author's mistakes and more time learning what is required to pass the exam. Although this is not the only book you should use to prepare for when practicing labs in BGP, QoS, Multicast Routing, Advanced Switching, Route Map and Policy-Based Routing, it is an excellent resource. I would rate this book a 4 out of 5 and would recommend this book as a primary source when studying for the CCIE lab exam due to its extensive lab examples and explanations. An Excellent Follow-up to Vol. I and Great Study Guide! A CCIE candidate has to be very careful about the books he/she may select as a study guide. Most often, the two biggest problems about a CCIE study guide is either the material is extremely dated or the book itself is riddled with errors and is elementary on the topic it professes to educate the reader about. Thankfully, Karl Solie's CCIE Practical Studies Vol. II is neither of these. I was pleasantly surprised by the quality of Solie's first CCIE Practical Studies. I was disappointed in other CCIE study guides, notably the earlier Hutnik/Saterlee "CCIE Lab Practice Kit". Practical Studies Vol. I, while having some dated material such as coverage of the Cat5xxx Series, provides an excellent treatment and foundation for Layer 2 protocols and IGPs. The labs at the end of the book were also of excellent quality. I picked up CCIE Practical Studies in late December as a last minute addition to my CCIE prep library. I was scheduled to take the lab in February, and I anxiously awaited arrival. Needless to say, I was not disappointed! CCIE Practical Studies Vol. II coverage begins where Vol. I left off. The topics of focus include the Cat3550s, route-maps, multicast, and BGP. I found the chapters on BGP especially helpful. Upon completion of these chapters and labs, I had a much better grasp on BGP and the protocol's bells, whistles, and knobs. The appendix includes a great piece on prefix lists, an absolute must for any CCIE candidate. Finally, the labs at the end of the book were terrific, on par to many of the various "boot camp labs" available for purchase. If I must provide one negative, it is that the author was inconsistent on providing IOS requirements needed to complete the labs. Sometimes Solie was kind enough to let me know I needed 12.2(T) or 12.3, and other times it was overlooked. As a result, during one lab, I needed to upgrade my IOS code and swap a router in the middle of my practice. A pain but, certainly not the end of the world. As for my lab, I passed on February 26, 2004, CCIE #12932. I firmly believe that I would not have passed if not for Solie's wonderful treatment of BGP in CCIE Practical Studies Vol. II! 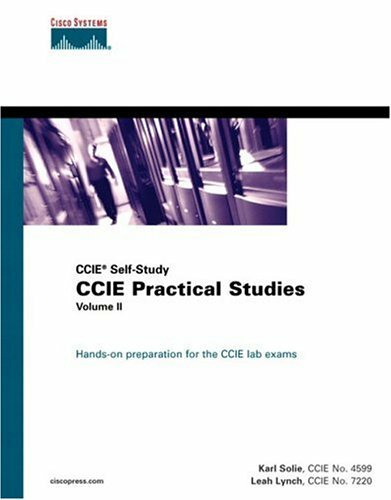 CCIE Practical Studies, Volume II (Karl Solie & Leah Lynch) shows CCIE candidates a process for CCIE lab exam preparation.A good book to be read along with Volume I of the same tittleprovides coverage of CCIE lab exam topics not covered in Volume I:route maps, BGP, QoS,and Multicast. Together with Volume I, the CCIE candidate experiences comprehensive coverage of the Routing & Switching, Security, and Service Provider labs. This book is recommended by CCIE training groups such as NLI & IPExpert. Summary: What I liked about the book. It is very detailed and includes practice labs. Because of its in depth detailed coverage of topics such as Route Maps, it will likely remain a source of reference for the next 10 years. If the reader is looking for loads of information concerning BGP, Route Maps, etc this book is the answer; however, if you have already passed the written test and are preparing for the lab it may be better to spend time on actually configuring your own network equipment that you have already purchased on ebay at a discounted price. Somewhere I noticed that a reader had cruised through this fine text in 2 evenings. At close to 900 pages it could take 2 days just to page through it... reading & comprehending the very detailed concepts should take most mortals much much longer. Very Good Information - You need this. I was looking for this information to supplement the information provided in the support exam documentation and the performance field guide from MG Hill, and online docs. This book has great information but does need to have a different name as I thought this would be more geared toward how the IOS was actually programmed and give a better understanding of IOS versions. What there is is pretty good. There is a lot of good information in this book that I've never seen anywhere else, so I'm going to give it 4 stars...though, it should be called something like "How some Cisco routers switch packets and use buffers".It is far from a thorough treatment of IOS internals- but what is there is well written and valuable.I especially enjoyed the discussions about the algorithms and data structures used by the various fast switching methods. This book centers around buffer allocations and buffering problems.It will give you a better understanding of when different buffers are used.I think the title should have been "Cisco IOS Buffering, What you need to know". You definitely have to read between the lines to fill in what all is happening to the data as it flows through the router in different ways.I feel that it is rather limited in it's descriptions of the IOS SW Architecture so don't expect to come away with the full details on how IOS does its job. I bought this book and read it cover to cover in about two weeks (which for me is pretty good).It's definitely not for beginners, in fact it really benefits people who are running BFRs like 7200 and bigger.Good detail about 7500 and 12000 architectures. It also gave me a lot of little bits of knowledge that made sense but I hadn't thought about before.Example - if you have a 7206 stacked with fast ethernet cards but your only using half of them, IOS is allocating buffer space to every interface anyway, so pull those cards. Other topics are queuing methods like weighted RED and a very coherent discussion of process/fast/CEF/distributed switching. As a final exam preparation tool, CCIE Routing and Switching Exam Quick Reference Sheets provides a concise review of all objectives on the new CCIE Routing and Switching v3.0 written exam (350-001). This digital Short Cut provides you with detailed, graphical-based information, highlighting only the key topics in cram-style format. With this document as your guide, you will review topics on networking theory, LAN switching, IP routing, QoS, WAN, IP multicast, security and wireless topics. These fact-filled Quick Reference Sheets allow you to get all-important information at a glance, helping you to focus your study on areas of weakness and to enhance memory retention of essential exam concepts. The Cisco CCIE Wireless certification assesses and validates wireless expertise. Candidates who pass the CCIE Wireless certification exams demonstrate broad theoretical knowledge of wireless networking and a solid understanding of wireless local area networking (WLAN) technologies from Cisco, the market leader in WLAN technology. Expert Level Knowledge and Experience - Cisco CCIE Routing and Switching Certifies the skills required of expert-level network engineers to plan, operate and troubleshoot complex, converged network infrastructure. I bought the CCIE pass at 1st try by williams Manning. I wish there had been a review posted before I bought this, because I wasted $16. This 'book' is useless, it's just a bunch of words thrown together that have to do with the CCIE. Really. Don't waste your money or time on this.